With all of the incentives available for energy efficiency, it’s no wonder that many facilities are planning—or are currently undergoing—efficiency upgrades. As an insulation contractor, I’m a huge advocate of energy savings, and many people don’t realize how much energy (and in turn money) they can save by choosing energy-efficient equipment and optimizing existing processes. But when the planning happens for these fantastic upgrades, there’s usually one major energy-saver missing from the discussion: mechanical insulation. Those initiatives have the makings of a great plan, with one problem. There’s no mention of mechanical insulation. Insulation is a simple way for facilities to save money and energy that doesn’t involve overhauling your entire HVAC system or installing new lighting. Insulation is a way to optimize your existing systems and setups. I’ve posted several articles on this blog about how much energy mechanical insulation can save, all with an average ROI of less than 2 years. Check out the links and see the potential savings for yourself. How Can You Account for Insulation in Your Efficiency Upgrade Plan? The first step is to contact a certified insulation energy appraiser and schedule an audit of your facility. Insulation energy appraisers use specialized equipment and software calculations to determine exactly how much your facility could save with insulation. The next step is to work with your insulation contractor to figure out what type of insulation is best for your specific application. 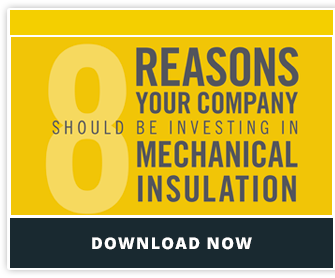 Different types of insulation work best for different applications, and an experienced insulator will be able to recommend what’s right for your processes. Mechanical insulation should be included in the budget for any efficiency upgrade. Your facility can begin saving energy immediately—what’s better than that?